Outstanding representatives of electronic club music, this DJ/production duo has been steadily winning over fans outside of Russia since 2010. Already touted as “ones to watch” by some of the dance music world’s leading tastemakers and DJs, Matisse & Sadko’s fans include Swedish House Mafiosos Steve Angello (who tapped Matisse & Sadko for his label Size Records’ 100th release, “SLVR,” which topped Beatport’s main chart in the summer of 2013) and Axwell. With high profile releases on labels such as Size, Armada, Spinnin’ Records and more, M&S’ production prowess has made the duo rising stars from Russia’s EDM world. Their singles "Hi Scandinavia," "Svenska," and "Amulet" have been supported by the best DJs & producers in the business and included in their major festival sets & radio shows. Their collaboration with popular Russian project Swanky Tunes & Hard Rock Sofa, “Chemistry,” was praised by major house & progressive artists such as Avicii, Swedish House Mafia, Dirty South, Tiesto, and Armin Van Buuren. And their beloved single "Trio (feat. Arty)" was released on Axwell’s label, Axtone Records….subsequently receiving massive support by Pete Tong, who made it an "Essential Selection" on his BBC Radio 1 show. But it isn’t just Arty, Sander Van Doorn, Swedish House Mafia, Armin van Buuren, Tiesto, Above & Beyond, Thomas Gold, and Michael Woods playing Matisse & Sadko’s music in their sets, they have also earned their place amongst them as live performers as well. Matisse & Sadko are regular billed artists at highly respected touring event Sensation, the world’s leading dance party (they have been the only Russian artists whose talent was noted specifically by ID&T and by event creator Duncan Stutterheim). Their performance is not a simple DJ set, but a true live experience. You can see that in the reaction from fans that know them, and even new crowds that are experiencing Matisse & Sadko for the first time. 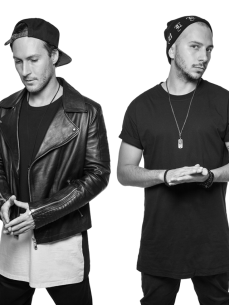 Whether on tour in America or at the Global Gathering and other festivals, Matisse & Sadko’s stage presence is undeniable (agencies SPIN Artist Agency and IMD have signed them to exclusive representation in Europe and America).